A new advertisment campaign is to tackle film piracy by promoting the benefits of visiting the cinema. The trailers, to be screened in cinemas from next month, will carry the message that pirate copies are an inferior product to the cinema experience. "Films should be enjoyed at their best, in the way they are meant to be seen," said Mark Batey, head of the UK Film Distributors' Association. The first trailer will feature the cast of forthcoming release Fantastic Four. Welsh actor Ioan Gruffudd stars alongside Sin City's Jessica Alba and Julian McMahon from TV show Nip/Tuck in Fantastic Four. Another four trailers, which will be coming out in the next few months, are also expected to be tied to new releases, said Mr Batey. Linking new releases to the promotional campaign is significant, as a film has its biggest value to illegal bootleggers in the weeks ahead of making its big screen debut. "We would like to target less frequent cinema-goers and steer them away from a product that is inferior - the fuzzy pirate copy," added Mr Batey. The new "pro-cinema" approach was formulated after research showed that telling consumers about the damage being done by film piracy was not making a big impact. 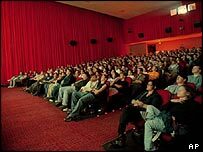 Film-goers often pointed out the importance of having an enjoyable visit to the cinema when questioned by the researchers.